CodeSonar's source code analysis engine identifies problems that developers care about finding, like data races, deadlock, buffer overruns, leaks, null-pointer dereferences, and uninitialized variables. CodeSonar's binary analysis finds vulnerabilities and defects in machine code (both whole executables and libraries), so you can perform a security analysis even if source code is unavailable. 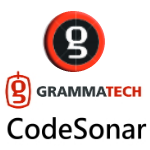 CodeSonar ships with an assortment of metrics at function, file, and analysis granularity. An 'x' in the following table indicates that the corresponding metric is computed at the specified granularity. Click any metric name to learn more about the metric. With CodeSonar's highly customizable static analysis engine, you can extend both the set of metrics computed and the set of uses for those metrics. Define derived metrics based on these count metrics. For example, if you want to know the ratio of Code Lines to Total Lines, you can instruct CodeSonar to compute and report it. Specify custom metrics that count other code phenomena. With API access to the various internal representations computed by CodeSonar's analysis engine, you can count just about anything, from global variables to loops. Design custom warning classes so that CodeSonar warnings are issued whenever the value of a particular metric is outside a specified range. This can help enforce coding standards that govern factors like maximum function size, or minimum commenting level.